Kill Doctor Lucky is a Cheapass Games game and only comes with the parts that are unique to this game, the cards and the game board. The meeple you see in the photos are taken from Kosmos’s “Der Hexer von Salem“. This review is based on the German edition of Kill Doctor Lucky published by Mario Truant Verlag. The clock has just finished banging midnight on Lucky Manor, about 7 miles north of nowhere, when all the lights suddenly turn off. Now is your chance. You hated the old geezer since forever, and no is around except you, him… and a whole bunch of other guests who all want to murder him first. That is all the background story this “Pre-Crime-Story” game gives you. No mention of why you hate Doctor J. Robert Lucky so much and why you want to kill him. By the end of the game, you won’t mind not having a motive, you will just hate the Doctor enough that you seriously want to kill him. Why is that? Because he is LUCKY, all capitals, and before he finally bites the bullet (or the rope, or the duck decoy…), you will make many failed attempts for his life. If the Doctor does have a weakness, it’s that he is highly predictable. Like many old people, he is rather set in his ways and tours through his house over and over on the same worn-out path on the wooden floor. Unlike most old people, however, he is much faster than his pursuers and has an uncanny ability to avoid even the best-planned trap. You will have to play your cards right if you want to be the one that finally gets him 6 feet under. Movement cards: they allow you to move either yourself or the Doctor by one, two or three rooms, counting corridors and staircases. Room cards: a handy little teleportation system that the Doctor had installed in order to escape from awkward family dinners. A room card allows you to move either yourself or the Doctor into the room names on the card. Failure cards: Failure cards have a value between one and three, and when a player tries to help the Doctor into an early grave every other player has one chance to play failure cards. If the combined value of the failure cards matches or exceeds the value of the weapon, the Doctor made a lucky escape. Again. You can Rummage Around for useful things. You have to be in a named room – the corridors and staircases are kept meticulously clean by the Doctor’s invisible servants – to rummage and you can not move afterwards, only before. Rummaging lets you draw one card. You can Do Stuff. When you decide to do stuff, you may play as many cards from your hand as you like, before and after your free move. You may also end your turn with an attempt on Doctor Lucky’s life. This is where the game gets interesting. To try and kill the Doctor, you naturally want to be unobserved. You can only try to murder J. Robert Lucky when no other player can look into the room that you and the Doctor occupy, and the Doctor has a very strict open doors policy in his house. So if the room you are in can be seen from a room occupied by another player, all you do to the Doctor is force him into some boring small talk. If you are unobserved, however, you can unpack your weaponry and try to give him a friendly tap on the skull. 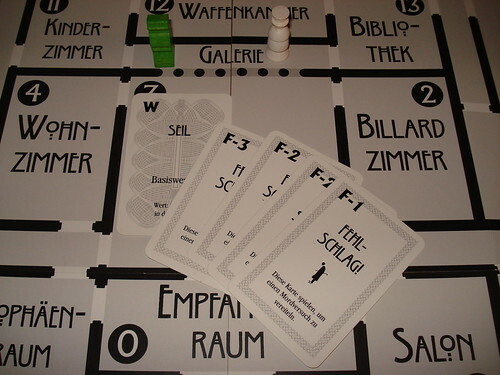 Each player, starting from your left, now gets one chance to play Failure cards. Failure cards are played openly, but no one forces you to play any, and no one forces you to be honest about having any. When not playing failure cards although you own plenty, make sure that the players playing after you have a few cards in their hand. It’s quite embarrassing to lose to an early assassin because you stockpiled your Failure cards and the next player was sitting empty-handed. Failure cards are by far the most plentiful in the beginning of the game, giving you little hope of ever getting your inheritance/your revenge/your lawn-mower back. But even the Doctor’s luck will run out eventually: the Failure cards go to a separate discard pile, and while all the other cards are shuffled and reused when the draw pile runs out, Failures stay out. After every players turn, the Doctor moves to the next numbered room or to the adjacent room with the highest number if he ended up on a corridor or staircase. As you can see, the Doctor is a runner and on your next turn he will be in an entirely different part of his mansion. So far, the game boils down to simply counting the rooms to where the Doctor will be on your next turn and trying to catch him alone somewhere, drawing cards one by one on the way. But it’s a bit more interesting that this due to the unique turn order mechanic. Usually, the game proceeds clockwise like most other games. But as soon as the Doctor enters a room that is occupied by a player meeple, it is immediately that players turn – must be the adrenalin surge from being discovered leafing through the Doctor’s collection of rare medieval erotica. If there is more than one player in that room, the next player is the first one to the left of the current player that is present. Keep that in mind when setting up your chain moves, you can be sure that it’s not your turn again after moving into an occupied room just ahead of the Doctor. Also keep in mind that the Doctor doesn’t enter corridors or staircases by himself, so those also put a stop to overly long chains. 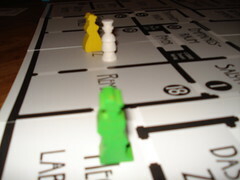 The turn order adds a bit of strategic depth to the game, but nevertheless, it’s a light game. You spend a lot of time with short turns collecting cards, and your choices of what to do are limited by the cards you hold. 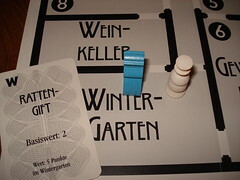 There is a n in-built timer preventing the game from running too long with the Failure cards being removed from the game after use – sooner or later someone can kill the Doctor simply because the Failures are used up – making it a fun filler or light after-dinner game with the right number of people. The right number of people is not two or three, although the package tells you otherwise. True, it can be played, but with two few guests in the house, it becomes too easy to catch the Doctor alone and the element of bluffing about the number of Failure cards you hold disappears entirely. If you don’t play the Failure, who will? Neither is the right number of players seven or eight. The game does develop a nice amount of chaos with many players and the Failure bluffing becomes more important, but the turn order becomes a problem. It’s very easy for one player to not take a turn for a long time because the turn order keeps jumping around him, making that player a very unhappy person indeed. Four players is a good number to play, five or six make the game genuinely fun and will usually see the Doctor killed after 30-40 minutes. By that time, he will have narrowly escaped you enough times that you really hate his guts and won’t think about the inheritance/revenge/lawn-mower at all while braining him with the duck decoy (Value: 4 in the Trophy Room).